Global financial conditions have tightened modestly this year due to the tapering of quantitative easing in the U.S., increasing interest rates globally and a retreat from the synchronized growth we experienced in 2017. Because inflation remains low, we expect global central banks to tighten policy at a restrained pace. This should contribute to a stabilization of financial conditions as the year progresses and should be positive for risky assets. Investors should be cautious, however, because if inflation accelerates, monetary policy could become more aggressive. This could result in a sharp tightening of financial conditions which could disrupt markets. Increased trade tensions may also generate unanticipated tightening. Trade rhetoric and actions have been contentious between the U.S. and its major trading partners. Although a political compromise is possible, a broad and drawn-out “trade war” is a risk, and the events of recent weeks have increased the likelihood we see further escalation. Risks associated with protectionism, such as reduced global trade, could negatively impact global growth and inflation. In the U.S., aggressive tariff hikes would likely result in higher inflation. However, this inflation would probably be temporary, more akin to a tax increase than the demand-driven type of inflation that monetary policymakers are seeking. We believe most of the impact on growth due to increased tariffs would depend on the extent of deterioration in market conditions. A trade shock combined with a sharp market sell-off is much more likely to generate a poor growth outcome than a trade shock alone, in our view. In Europe, we see potential downside risks to the eurozone economy as more significant if sectors such as car imports are targeted. In China, we believe negotiation (rather than retaliation) is preferred by the Chinese government. As China further opens its domestic market, lowers trade tariffs and improves intellectual property rights protection, there is more room for dialogue with the U.S., in our view. However, we remain mindful there could be ongoing uncertainty regarding U.S. trade policy. In recent weeks, we have seen surprise actions on the part of U.S. President Donald Trump’s administration related to new tariffs and we may see more as we approach this year’s U.S. midterm elections. In addition, China is determined to pursue its “Made in China 2025” strategy to advance its global competitiveness in technology and manufacturing. The Trump administration has reportedly demanded that China stop subsidizing high-technology industries under this initiative. It may be very difficult to close the gap between the two countries on this issue. Eurozone political headlines have been focused on two key countries. In Italy, a new populist coalition government has been formed, and in Germany, the ruling coalition parties are battling internal disagreements. In addition to these headlines, politics have been eventful across the continent – strikes in France in response to President Emmanuel Macron’s reform agenda, a new government in Spain, and of course, Brexit in the UK. Several big questions remain unanswered. Will political uncertainty lead to a meaningful loss of confidence among businesses and consumers? Will domestic political agendas prevent further strengthening of eurozone institutions? And will financial markets require more risk premiums if uncertainty is higher, potentially derailing the strong recovery we have been experiencing? Our central view is the difficult issues will ultimately be resolved in a positive manner – the Italian coalition delivers on objectives in a way that is in the spirit of the eurozone budgetary framework, a compromise solution is found to immigration challenges to calm disagreements in Germany and beyond, and a Brexit agreement is ultimately reached. However, it is clear the risks have gone up. Because central banks are reaching the end of their stimulus programs, they are less apt to provide a backstop if things go wrong, leaving markets more nervous. We think this may present buying opportunities for active managers, as markets may overreact as they struggle to discount low probability but high-impact events. China’s goal to reorient its economy away from export-led growth toward more domestically oriented drivers is a major challenge. The process of transition from a largely command-driven economy to a more market-oriented one could lead to policy missteps and market disruption.1 While the government has successfully stabilized past periods of heavy capital outflows and renminbi volatility through various monetary and regulatory measures, the possibility of a surge in outflows and currency pressure remains a concern. Such moves could be destabilizing to China’s economy and global financial markets. Most recently, the government has focused on lowering financial risk, seeking to reduce leverage across many sectors of the economy. Tighter regulation of financial companies (especially the “shadow” banking sector) has restricted lending, leading to a slowdown in credit creation. While this has resulted in a moderate economic slowdown, the government has stated its preference for “quality” over “quantity” of growth. We are watching for signs of more than a moderate economic slowdown as the government balances tighter financial regulation with offsetting injections of liquidity into the system. A resumption of pressure on capital flows or the currency would also likely be negative for markets. But our central case is for general stability in growth and financial indicators in the near term. The risks to emerging markets (EM) are largely related to political uncertainties, and to a lesser extent, sensitivity to rising U.S. interest rates and dollar strength. The conventional wisdom suggests that EM is highly vulnerable during periods when the U.S. dollar and U.S. rates rise. Indeed, EM countries are reliant on external funding – primarily in U.S. dollars. However, EM as an asset class has not always struggled during periods of rising U.S. rates and a rising dollar; during 2004 to 2006, EM assets performed well even while suffering through the initial rise in U.S. rates in early 2004. Additionally, most countries have more than sufficient liquid external dollar assets to fund external liabilities coming due over the next year. Two exceptions are Argentina and Turkey, whose fixed income markets and currencies have exhibited considerable market volatility in recent weeks. Argentina has since agreed to a standby arrangement with the International Monetary Fund which, if it conforms to program requirements, should provide sufficient external funding for the country through 2019. Turkey has thus far resorted to raising policy rates in an attempt to stabilize the currency. Uncertainty surrounding the impact of various EM elections (such as those recently held in Turkey and Mexico, with Brazilian elections scheduled for October) will be a market focus for the rest of the year. The concern is that, in each case, policy may be oriented in a less market-friendly, more interventionist direction. This could lead to more volatility in asset prices. 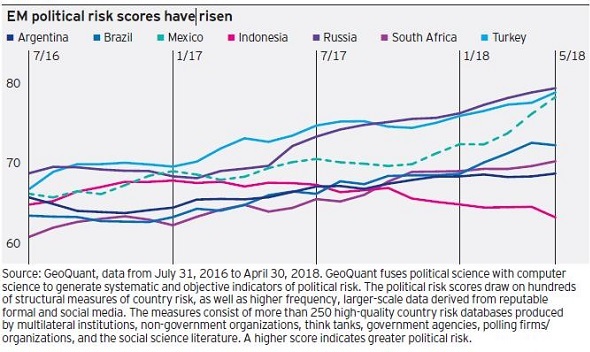 In fact, measures of political risk in EM are generally on the rise. Therefore, we are becoming more selective, taking a wait-and-see approach to countries whose election outcomes may lead to less market-friendly policies. We currently favour markets of countries where we see positive fundamentals, a lack of domestic political uncertainties and compelling valuations. 1 Source: The Brookings Institution, China’s economy and financial markets: Reforms and risks, Eswar Prasad, April 27, 2016. Tapering is the gradual winding down of central bank activities that aimed to reverse poor economic conditions. Investments in companies located or operating in Greater China are subject to the following risks: nationalization, expropriation, or confiscation of property, difficulty in obtaining and/or enforcing judgments, alteration or discontinuation of economic reforms, military conflicts, and China’s dependency on the economies of other Asian countries, many of which are developing countries. Many countries in the European Union are susceptible to high economic risks associated with high levels of debt, notably due to investments in sovereign debts of European countries such as Greece, Italy and Spain. The information provided is for educational purposes only and does not constitute a recommendation of the suitability of any investment strategy for a particular investor. Invesco does not provide tax advice. The tax information contained herein is general and is not exhaustive by nature. Federal and state tax laws are complex and constantly changing. Investors should always consult their own legal or tax professional for information concerning their individual situation. The opinions expressed are those of the authors, are based on current market conditions and are subject to change without notice. These opinions may differ from those of other Invesco investment professionals.